Keeping in mind the ever-evolving requirements of our precious clients, we are manufacturing and supplying an exclusive range of Brass Triangle Tower Bolt. 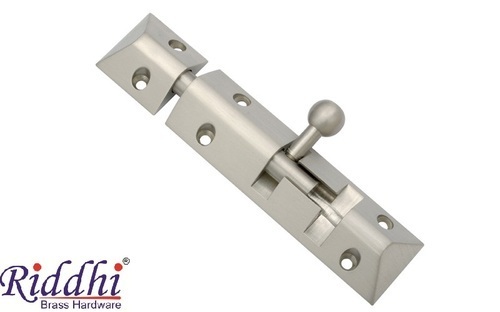 Established in the year 1997 at Jamnagar (Gujarat, India), as a Sole Proprietorship company we “Riddhi Brass Industries”, are dedicated towards Manufacturing and Supplying the finest quality range of Brass Mirror Cap, Brass Tower Bolts, Brass Hinges,Brass Road Latch, Brass Gate Hook, Window Fitting, Brass Baby Latch, etc.We are offering a wide range of door and window accessories in diverse specifications. Moreover, because of our swift delivery, flawless range, easy payment options and affordable prices, we have become the preferred choice of the patrons. Under the leadership of our Mentor “Mr. Ramnik Bhai”, we have secured an edge over other leading companies in this industry.